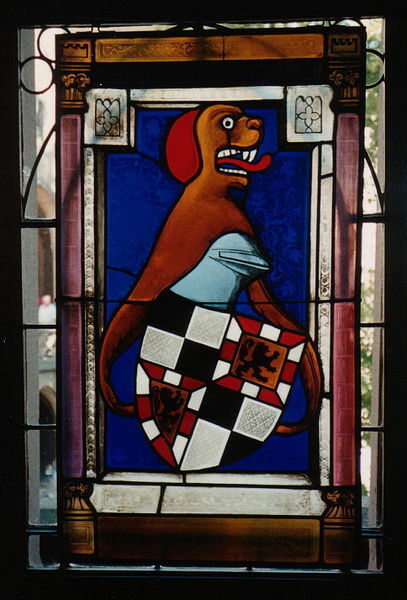 The Hohenzollerns traced their origins back to the tenth-century dukes of Swabia, where they were lords of the castle of Zollern in the Black Forest region of southern Germany. The first recorded member of the family is Burchard I, the eleventh-century count of Zollern.In the next 200 years, the family’s faithful service to the Hohenstaufen emperors brought them increased land and power. It was with Emperor Frederick I Barbarossa’s support that the Hohenzollern built their castle on the Zollern mountain, from which their derived their family name. The first truly prominent member of the family was Frederick III, who served the duke of Swabia, Frederick of Hohenstaufen. 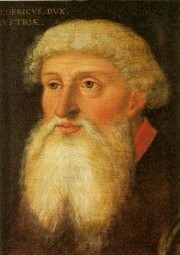 In 1191, Frederick III married the heiress of the burgrave of Nuremberg, and became a burgrave himself the following year as Frederick I. Frederick established his dynasty, throughout Franconia, and before his death in 1204, split his acquired territories between his two sons, Conrad and Frederick IV. In 1227, Frederick I’s sons divided up the family inheritance, creating two branches of the family, the Franconian and the Swabian lines. Conrad received Nuremberg, starting the Franconian line, which became Protestant after the Reformation. His brother Frederick received the Swabian estates, beginning the Swabian line, which remained Roman Catholic. In the Middle Ages, the Franconian line was the more dominant of the two. Its members settled in Nuremberg and, during the Great Interregnum, gained political prominence. Frederic III (1220 – 1297), through his support of Rudolf of Habsburg, gained possession of Bayreuth for the family, and his descendants acquired Ansbach and Kulmbach. 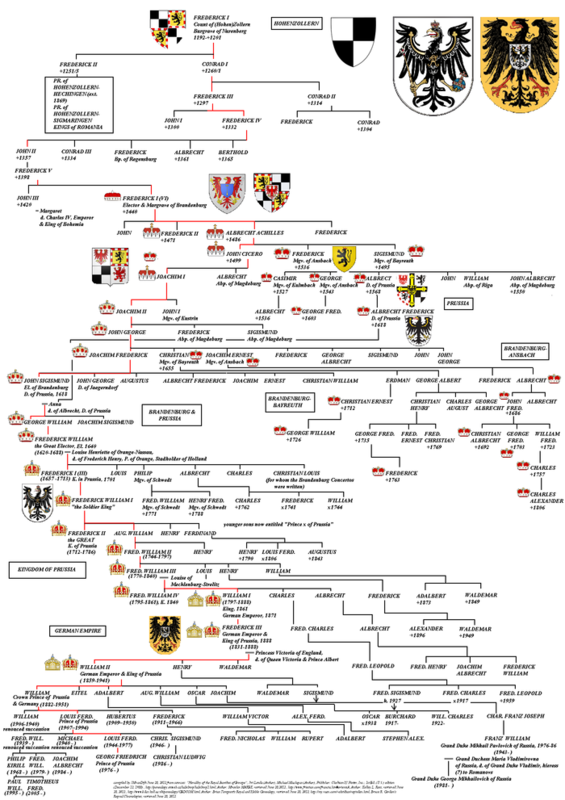 At the beginning of the fourteenth century, the Hohenzollerns were one of the most powerful families in Germany. 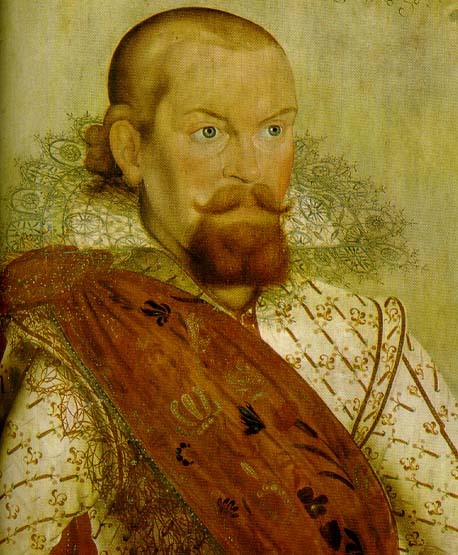 In 1363, Frederick V was elevated to the status of an imperial prince, and throughout the century, the family continued to prosper through its strong relationship with the emperors of the Luxemburg dynasty. In 1411, Emperor Sigismund rewarded Frederick VI, his trusted diplomatic adviser and count of Nuremberg, by appointing him margrave of Brandenburg. In 1415 Frederick was appointed an elector of German kings. The family held the position until 1918. They revived a stronger central government in Brandenburg in the intervening centuries. 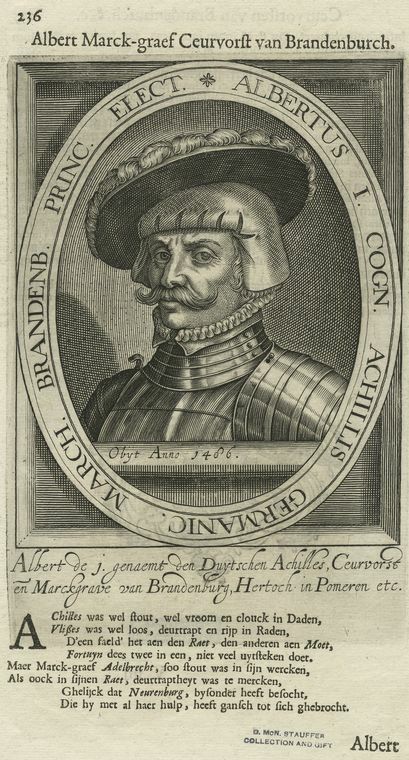 Frederick VI’s son, Albert Achilles, made Brandenburg the house’s principal territorial holding, after the Franconian possessions were yielded to a junior line of the family. The Brandenburg Hohenzollerns acquired considerable territories in the sixteenth century, including the influental duchy of Prussia in 1525, which was added to their holdings in 1618.